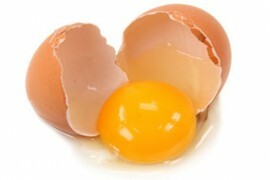 Dry egg white is a product derived from whites of fresh eggs obtained by means of separation of yolks. The liquid white obtained is subject to special thermic, mechanical processes and treatment by enzymes, and then, after drying in the spraying system, whites are going through pasteurization. After the filtration process, sugar extraction and dry pasteurization the egg white takes the form of white powder. The basic characteristics such as dry egg white whipping properties and foam stability sometimes are higher than in fresh egg whites. Fermented egg yolk is derived from fresh chicken eggs by means of separating the white and the yolk, without addition of stabilization systems, colorings and other food additives. The yolk is subject to enzyme activity, which separates the fatty acid of a phospholipid present in the fatty basis of the yolk and transforms it into a lysophospholipid. The fermented liquid yolk obtained is pasteurized, and then it is dried by means of spray drying, and the powder-like product is obtained. Egg powder is a concentrated food product derived from chicken eggs by means of drying the egg mass (white and yolk together). In average, 274 g of egg powder substitutes 1 kg of eggs (melange). It is actively used in the production of confectionery products, meat semifinished products. Is used in the production of potato, fish, meat, sausage products, breadcrumbs, dough products, etc. Egg powder is a product obtained by means of drying of liquid egg melange, which in its turn is a mix of chicken egg whites and yolks separated from shells. Is most often used in the production of mayonnaise, mayonnaise sauces.